…and the second thought never arrived. I tensed, waiting for it. Because 13 years of taking the ferry toward Taos to facilitate my writer’s retreat equaled 13 years of spending the ferry ride in a stew of “Who do I think I am to do this?” and feeling like a failure for what I didn’t write in the previous year. Surely this year would entail the same sticky litany. But instead of fear and recrimination, I only heard… spacious silence. Create what I want to create. It took me years to deeply honor that creating a sacred, safe container for writing to happen in, with a focus on craft for those who wanted it, was what I wanted. To own that this was my retreat, created by me. Sounds so simple but took me so long to grok. Collaborate with people who play at the same level. I had a history of collaborating with people who weren’t who they appeared to be and, once I discovered that, not acting on that knowing. “Believe people when they show you who they are” took me years to act upon. It’s cool to be a dyslexic, misspelling, mispronouncing writing guide. My learning disability shows up in misspellings and verbal mangling of words. Doing this in front of English Ph.D.’s, surgeons, directors of national non-profits, human rights lawyers, CEO’s (aka my retreatants) used to provoke deep shame in me. Now I just announce, “I have a learning disability,” and grin as I bumble and grin as everybody helps me. It rocks to have been a self-help author. I used to have a chip on my shoulder because I wasn’t a literary author. Now I proudly claim that I have published 8 self-help books. I wrote them; I marketed them. I did that. That matters. The container makes the magic. I used to cram so much into the retreat – two classes most days, field trips, guest lecturers in the evening. “These people paid good money…” Now I understand it is the retreat container – and the chance to rest and listen to one’s own voice – that people crave. Giving the finger to over-providing. Gone are the days of carrying luggage, bringing fresh towels, coaching my buns off. I am a human and impossible goals are deadly. I would think, ‘By next time at Taos, I will have finished the novel and sold it…” or some other version of raising the bar on myself. So demoralizing. Now I work to acknowledge the reality of my life, my business, and where my writing fits, and the truth I’m a slow writer. I walked away from fiction and embraced creative non-fiction. I acknowledged writing fiction depressed me. I’m not sure why – but for now, I am exploring creative non-fiction/memoir with far more verve. We shall see what happens. It’s okay that I don’t write much while I am teaching. I used to feel I should be writing as much as my participants. Ha! Here is where I tell you how I learned all this in the last 13 years and how you can learn it just by reading this blog post. You just giggled at that, right? is… I fell completely in love with the earthy, boundless miracle of being alive. I decided to firmly put that ahead of perfection, pleasing, being admired, ever rising productivity, a fantasy literary life, and being anywhere other than HERE. I decided to treasure myself and this life just as it is and took that as my forever heartfelt desire. And so there you have it. 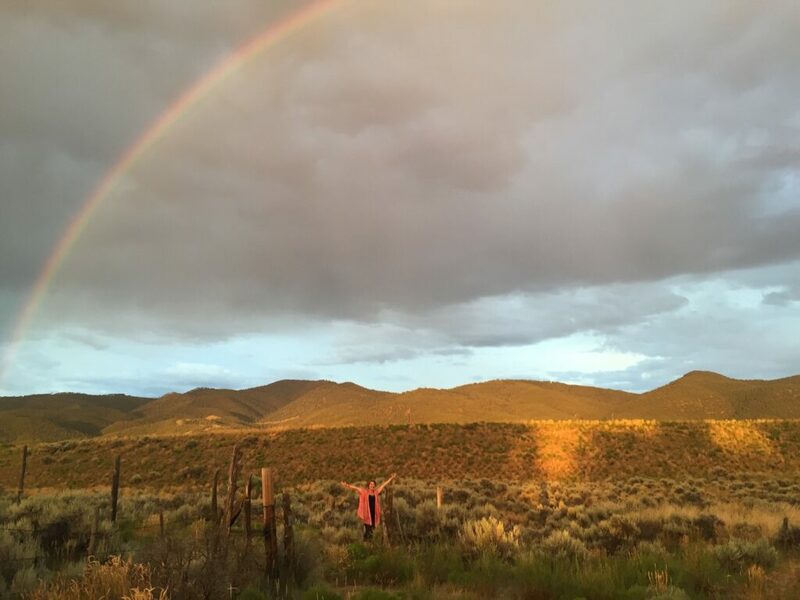 What more do we need except maybe a Taos rainbow? P.S. Thanks for being in my world.